Opened in 2008, The Grill Room & Bar was the second of four “Room” restaurants opened in Portland by Chef Harding Lee Smith. The Grill Room fancies itself an “urban steakhouse” and with their wood-fired grill offerings and contemporary menu, I think that’s a fair assessment. It goes without saying, but I’m going to say it anyway – the wood grill is the centerpiece of the cooking at The Grill Room. Among the mostly-grilled menu choices are soups and salads, a number of appetizers, pizzas, ala carte wood-grilled meats and fish with ala carte sides, and wood-grilled entrees. We had reservations – not ABOUT eating there, but TO eat there – and arrived a little early since we were already in the area. The Grill Room has a great outdoor area, so we requested outdoor seating. Our table was ready exactly at our reservation time and our request for outdoor seating was granted. The weather was perfect when we sat at the tall table with high chairs. We were left with menus and had a couple uninterrupted minutes to review them. Before long, our waitress showed up at our table and offered us water which we gladly accepted. She then took our drink orders – a Manhattan for me and a glass of wine for my wife. When she returned with our drinks shortly thereafter, we had the opportunity to ask a couple questions about the menu. We were also given the specials of the day. There were quite a few of them, but the one that stood out for me was the lobster mashed potatoes. Our server left for a few moments and we had some time to make our final decisions and sip our beverages. The starters looked great. I considered The Wedge – a lettuce wedge salad with bacon and blue cheese. I also thought about the Cheese Board, but with four cheese options, I thought it might be too much food for a starter. Finally, I decided on the Wood Oven–Baked Brie with chive oil, balsamic syrup, and pepper jelly. If it was half as good as it sounded, I knew it would be a winner. My wife ordered the Caesar Salad. For my main course, I went with the Maine-Raised Burger with sea salt fries and also threw on a side of the lobster mashed potatoes. She ordered the Wood-Grilled Salmon with the zippy sauce – their wood-grilled meats come with a house-made sauce – and a side of organic carrots. While we waited for our meals, we were brought some bread with olive oil and some salt and pepper. The bread was definitely one of the best around Portland – soft, slightly chewy, and flavorful with a hint of herb. I ate more than my share and probably would have eaten more if there was more in front of me. I tend not to eat much bread unless it’s part of a sandwich, but theirs is really exceptional. 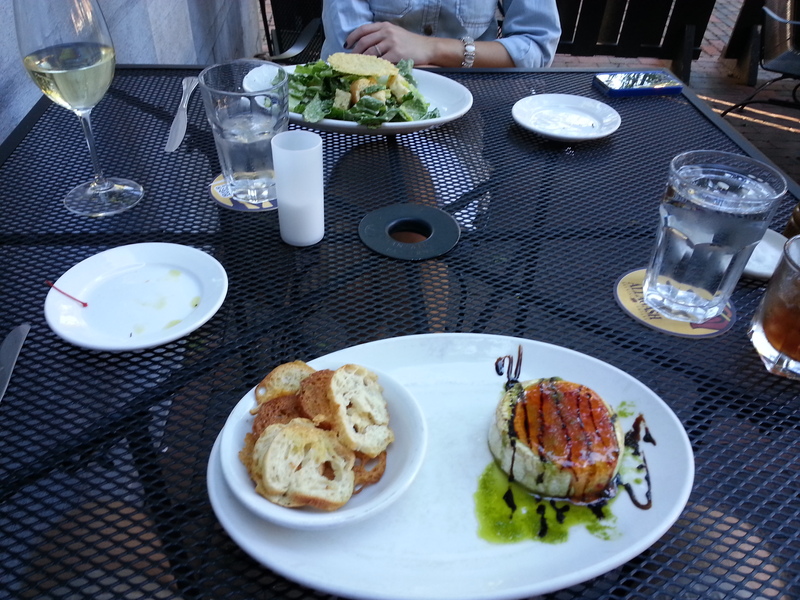 Shortly after the bread was finished, we received our appetizers. My brie was a large round hunk with the assorted toppings drizzled on. It came with several crispy bread/cracker pieces. My wife’s salad came with a crisp round piece of cheese on it. I assumed it was parmesan. They both looked delicious and we were more than ready to dig in. I immediately cut a slice of cheese from my spaceship-shaped brie brick. For good measure, I took the slice with my fork and dragged it through the oil, syrup, and jelly that were on the plate next to the cheese. Then I put it on top of the bread and dropped it into my pie-hole. Ho…ly…wow! The soft, warm, wood-grilled cheese complimented by the slight addition of spicy oil, sweet-spicy jelly, and the acidic syrup turned out to be one of the best appetizers I’ve ever had. Add in the crispy cheese-holding bread and you’ve got the type of food that gets a party started right and quickly. The Caesar Salad was a solid offering which my wife enjoyed. Both apps were finished in no time at all. I was thoroughly amazed at how great mine was. The rest of our meals came out a short time later as I was still basking in cheese afterglow. My burger came on ciabatta and had some standard and slightly fancy toppings. I ordered the burger with gruyere medium well and it was still juicy, though half of it was closer to medium rare. The local beef was fresh, high-quality, and made me feel good about supporting local farmers. The fries were piled high and fresh. They came with what I believe was lemon ketchup. My side of lobster mashed was sizable and had both small and large pieces of lobster. They definitely didn’t skimp on the costly crustacean. Her salmon and carrots were good. The salmon had a crispy outer crust and was moist inside. The carrots had a nice sweet, buttery glaze. Our meal was good without a doubt. I was overly full and should have passed up the lobster mash. The Grill Room is not inexpensive though, as our bill was closer to $100 than it was to $90. The food, service, and atmosphere are all great, but this Portland highlight fits into the special occasion category for me. However, the apps and drinks are quite reasonably priced relative to other local eateries so it might be worth a somewhat frequent trip to the bar. Regardless of your financial situation, you’ll definitely want to go to The Grill Room for the wood-grilled brie. The brie was out-of-this-world delicious and was only $9 by itself. It is very much worth that. Double your bill by having a signature drink and you’ll have an outstanding start to a great night without spending all your dough. If you’ve got more cash to spend and are looking for a special treat, they’ll serve you up a multiple course, tasty meal that will leave you happy and full. This entry was posted in Portland, ME food on August 14, 2013 by peterpeterportlandeater. So I want to go here and spend $100 for the wood smoked Brie?